I will admit that before I had this role I never gave deck boats much thought. I wrote them off as unattractive, though spacious. The more time I spend on them, though, the more I like them. Designers are upping the game to keep pace with my changing attitude and deck boats are sleeker and sexier than ever, not the big clunky ones I imagined in the past. After checking out the latest and greatest from Tahoe’s family, the 2150, I am now actively petitioning my family to invest in one for the cottage. 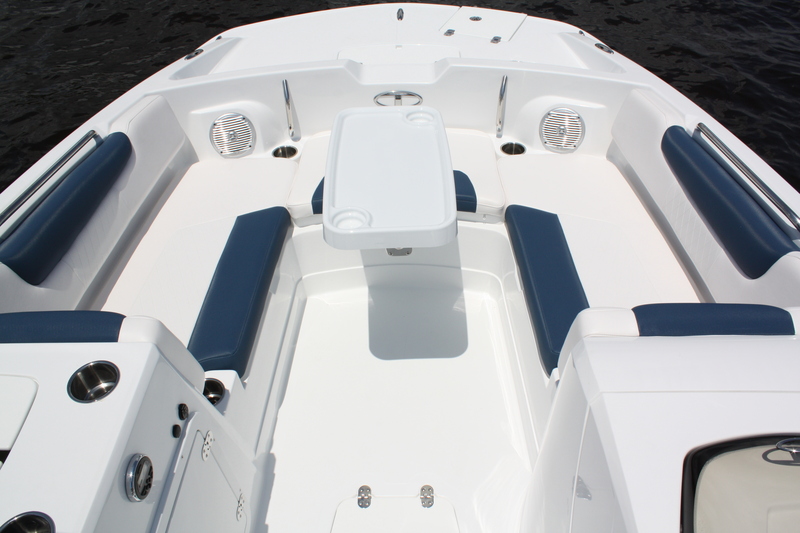 New for 2017, Tahoe’s deck boats have outboard power. 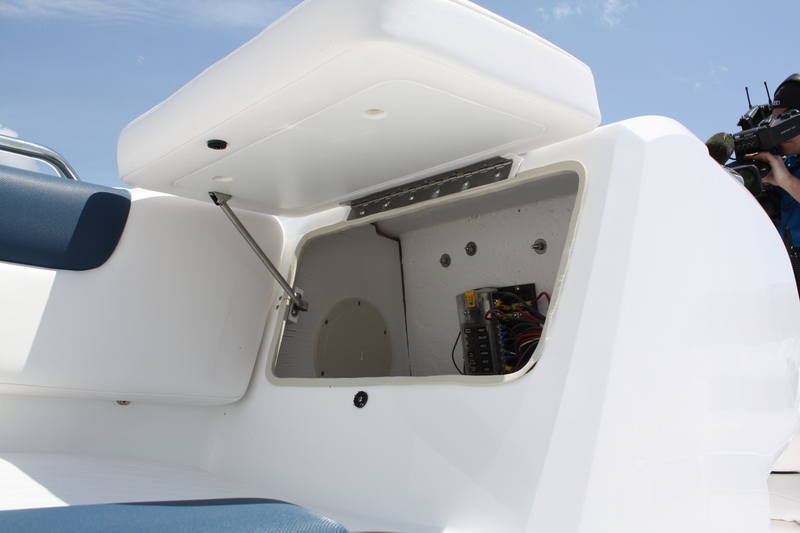 That means you can harness the lightweight, punchy new motors while opening up room in the transom for storage. Even still there is a good size swim platform with deep storage on either side of the 150 horsepower engine on our test boat. Without maxing out the engine rating of 225-hp, Tahoe’s PowerGlide hull helped turn in some impressive performance numbers. Running on a breezy day with two people and lots of camera gear on board we topped out at 48 miles per hour. While running I found about three-quarters throttle plus about 20-25 percent trim resulted in amazingly smooth runs in the high-30 to low-40 mph range depending on wind and chop direction. You could run this 11-person capacity boat with a smaller than max hp engine all day without feeling like you’re pushing it. 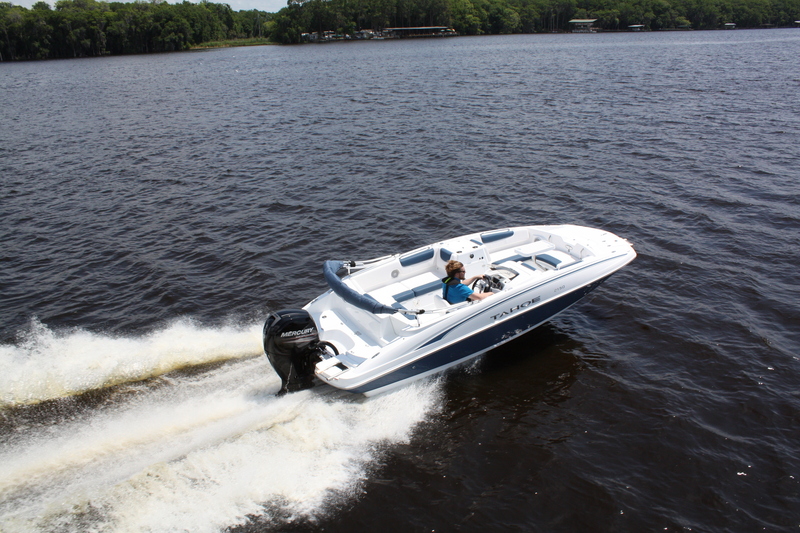 It’s a level of fun and performance you might not associate with the wider deck boat design, but it’s there. 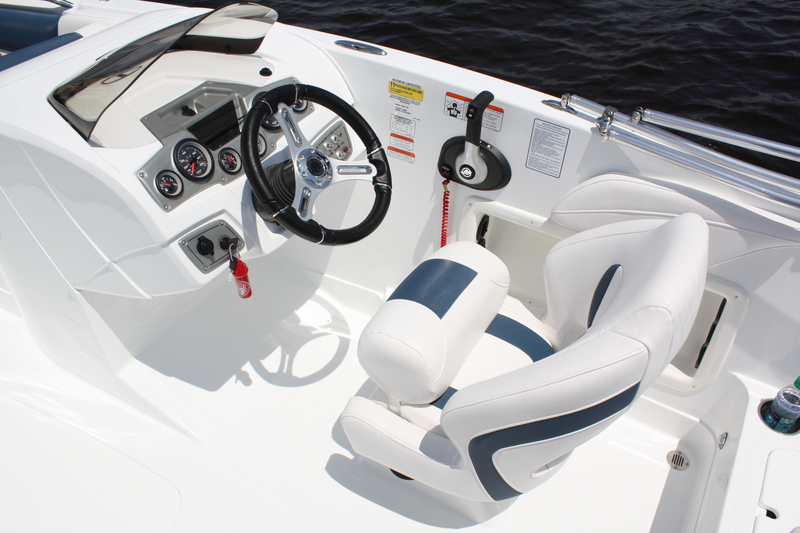 You can get the 2150 with a fishing package featuring bow-mounted trolling motor and the stern cooler outfitted like a livewell or you could add an optional waketower. Our test boat had neither but it didn’t feel like anything was missing. Running alongside in the chase boat, from up on the tower, our cameraman yelled down to me that he couldn’t believe how good it looked, especially when running. “It almost looks like an off-shore, go-fast kinda boat!” he yelled down. When I reviewed the footage and photos I saw what he meant. 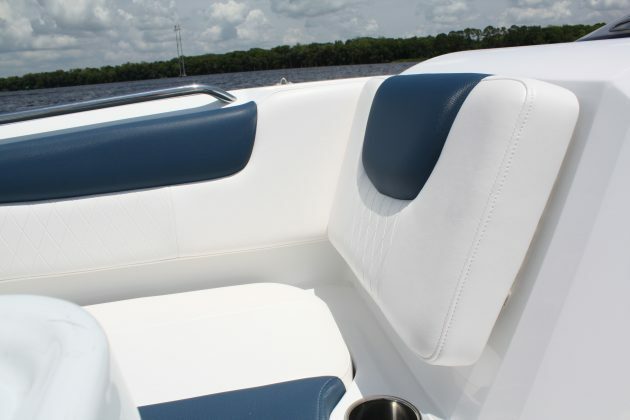 The entire boat curves sleekly around and down, while keeping the wide bow lounge, characteristic of a deck boat. It doesn’t look as big as it is. On board, you have a lot of space from the bow swim platform with telescoping ladder and seating, back to the large cushions that conceal storage space. 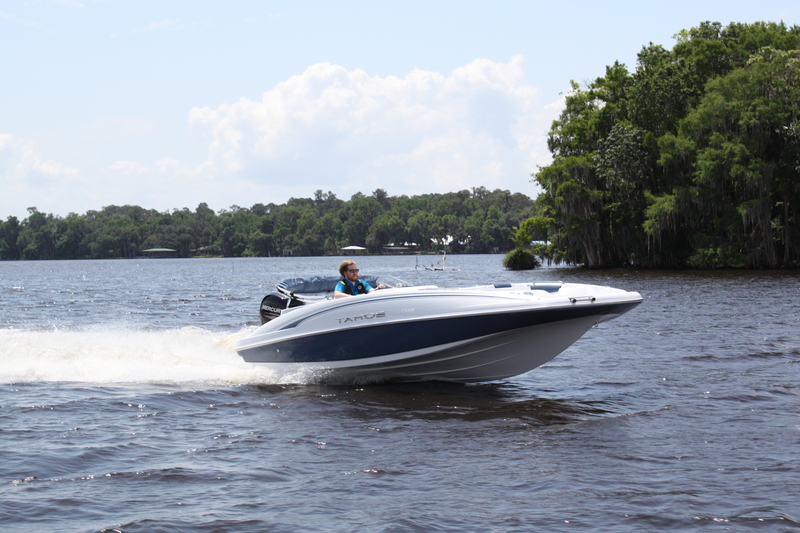 On the 2150 you’ll find a lot of what you’d expect on a deck boat; ample seating, a ton of storage, a wide-open runway down the centerline, and spacious swim platforms at bow and stern. But there are also a lot of clever touches. 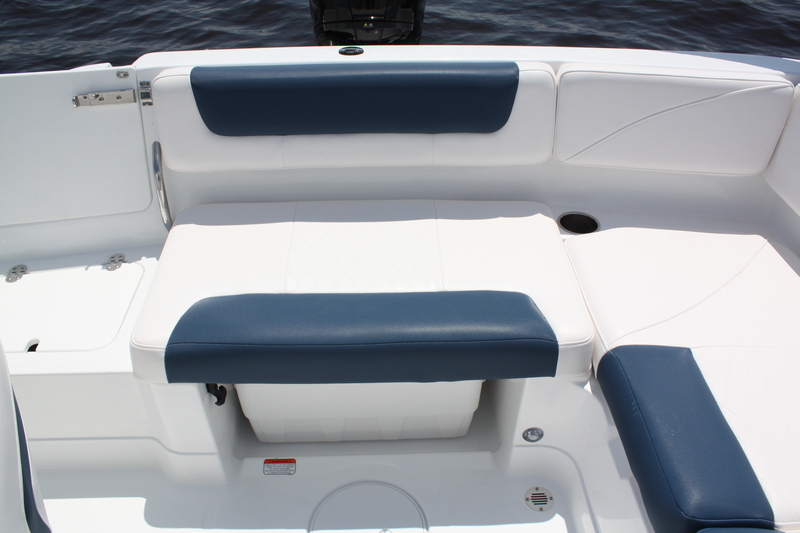 The backrest of the starboard side bow seating opens up to reveal easy access to wires and fuses. Not something you regularly need, but not having to struggle when you do is huge. 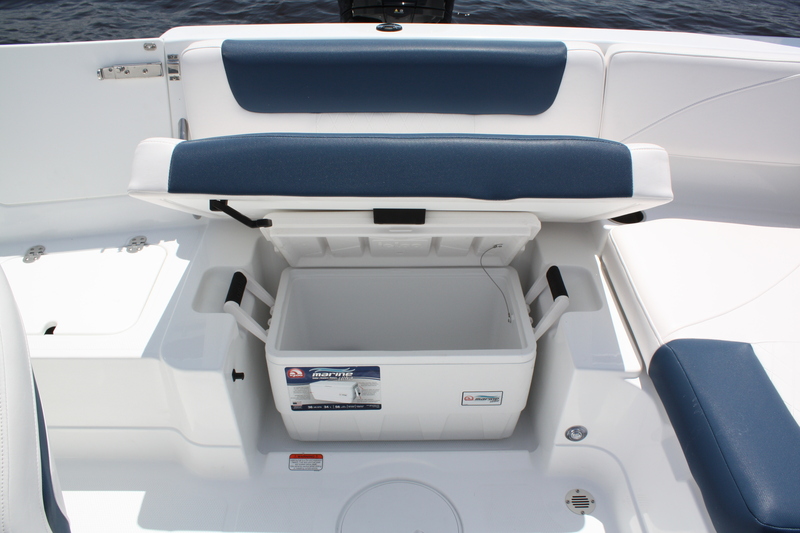 At the stern, the centre bench lifts up revealing a full-size cooler that locks into place with handle slots. The lid rests against a small lip that holds the cushion and cooler lid up so you don’t have to fumble while getting that cold beverage. When it’s down, the cushion secures with a simple but secure rubber clasp. Full marks to the Tahoe Team for that one. The only downside I found was that the dark accent colours on the edge of the cushions got pretty warm for bare legs in the hot Florida sun, but as I said to the cameraman as we gathered our gear, if that’s the biggest problem you can find on a boat, life is good! People go for deck boats to get the best of performance and space, and after spending a day on the 2017 Tahoe 2150, I think it could be one of the best of the best of both worlds.